You are driving back from dropping little Johnny off at school and you see a massive billboard advert for a local carpet shop advertising 50% OFF then a further 200% OFF THIS WEEKEND ONLY. Then you hear about it on the radio too, so you think … our Johnny needs a new carpet in his bedroom, lets go there, it must be so cheap because it is 75% OFF and a further 600% OFF this weekend only. So, you park in their massive store car park, walk round their massive store, taking your time because it is so lovely and warm in there. 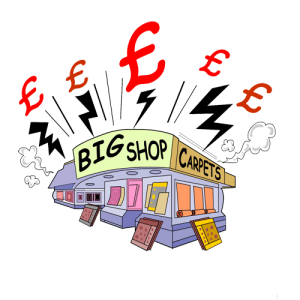 Then you see exactly the carpet you want, leave your deposit, take a sample home, take the sample back, get your deposit back to the store because it is a perfect match, and sort out “the details” with the store. So, you are driving back from dropping little Johnny off at school and you see a massive billboard advert for a local carpet shop advertising 50% OFF then a further 200% OFF THIS WEEKEND ONLY. so you think … our Johnny needs a new carpet in his bedroom, lets go there, it must be so cheap because it is 75% OFF and a further 600% OFF this weekend only. YOU are the only one paying for the huge costs associated with running a store and YOU have got to pay for it one way or another. Who else is going to pay for it? SERIOUSLY, STOP PAYING SO MUCH FOR YOUR FLOORING! 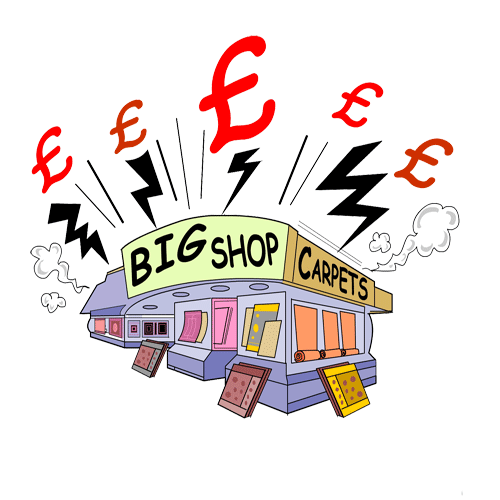 With our mobile carpet store covering Poole and Bournemouth and surrounding areas we simply don’t have anywhere near the overheads of the stores, we do very little advertising (we rely on our amazing customers to tell others about us) and you will usually get a much better quality carpet for less than you would with a store. What’s more, you can choose from 1000’s of ranges and colours all from the comfort of your own home. Some places will also tell you about their “free fitting” offer. I mean really? Would YOU Fit a Carpet For FREE? We offer honest, itemised pricing that usually beats the stores by hundreds and sometimes even thousands of pounds with no loss of service. All because our overheads are so low. © 2019 Great Choice Mobile Flooring Shop - 01202 377 577.